Anti-vaxxers are selfish and illogical. Not only do they prove to be a danger to their children, but they put the lives of others at risk too. Science and facts should be considered while deciding against vaccinating your child, but anti-vaxxers prefer “beliefs” over actual facts. Is that really worth the risk? We are only three months into 2019, and there have already been several outbreaks of measles in no less than 15 states. Most people are protected from these dangers spread by anti-vaxxers. However, sick and fragile people that are immunocompromised are at risk. Even though many states still allow vaccinations to be an option, the problem is continuously growing. Closing our eyes at it won’t make it go away. So that’s why some mothers decided to take action against their anti-vaxx neighbour to protect their community. They penned down a strong letter that the neighbour definitely deserved. They went in detail regarding the states that are at risk of outbreaks because of people like the neighbour. does not believe in vaccinating herself or her family. This puts anyone at risk if they are medically fragile, immunocompromised, or out of date in their vaccinations. Please use caution when sharing work or personal space with this individual, eating foods prepared by this individual, or attending gatherings at this individual’s house if you or the people who are important to you fall into medically at-risk categories. The unvaccinated pose a unique threat to infants, who often don’t yet have a full course of vaccinations completed, and can quickly become deathly ill or die. People who are unvaccinated have caused outbreaks in Arkansas, Oregon Washinton, California, New York, North Carolina, Michigan, Virginia, Texas, Kansas, Illinois, Kentucky, Florida, Minnesota, Colorado, and Pennsylvania, with more outbreaks expected. Nearly all outbreaks of disease were started by unvaccinated individuals, who pass along vaccine-preventable diseases to those without adequate protection. Sincerely, Concerned Moms of Wisconsin. The letter went viral, and rightfully so. 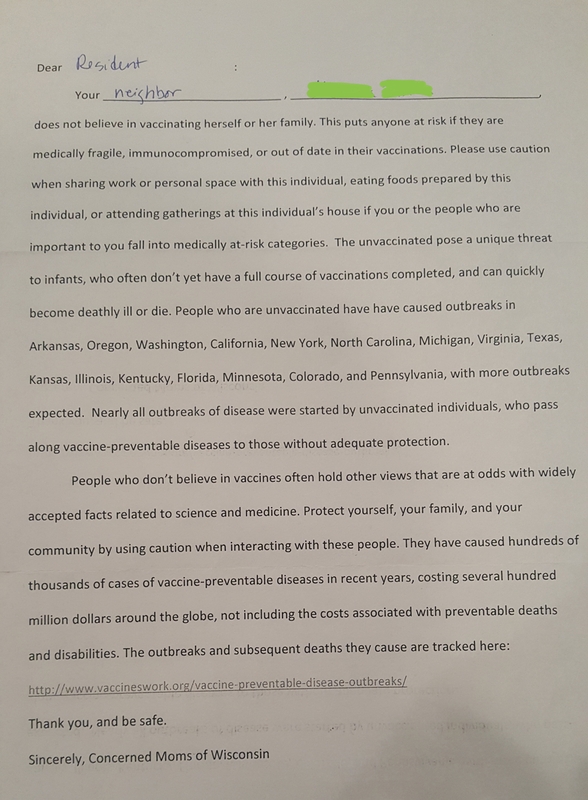 Hopefully, people will get inspired by this letter and take action against anti-vaxxers. Stay safe, everyone. What are your thoughts on vaccinations? Let us know in the comments below.